Good: The newly created, thanks to Susan and Teri, DeStash Blog. You can post the yarns, books and fiber you no longer want and sell it to others. Bad: The temptation to buy yarn, books and fiber that I don’t actually need! Ugly: Being too late for a couple of items I really would have bought. Good: Health insurance with prescription coverage. Bad: Prescription coverage that doesn’t cover Zyrtec – the one medicine that consistently relieves my seasonal allergies. Ugly: The headache I get when I don’t get to take the medicine that helps my seasonal allergies. Good: We get Panera for lunch every Friday here at the library. It’s something we all look forward to for the end of the work week. We especially like their soups. Bad: Our particular Panera does not adhere to the soup schedule. There’s one soup that we all really love and it’s seasonal. So, of course, everyone gets excited when we see it on the website. And then we call to order lunch and find out that they don’t have it. What’s the point of having a soup schedule if you’re just going to serve soup all willy-nilly? I mean, really. Ugly: The reactions of some of the library staff when they are told the soup they want isn’t available. I’m telling you, it can be downright violent around here when that happens! All I’ve got left are goods, isn’t that great? Good: Hand dyed sock yarn from a friend. That’s not just good, that’s awesome! Good: 91 knitters signed up to make a pink square for little Grace. When we pull it together, we really pull it together! Good: Cece is participating in the Breast Cancer 3-Day Walk. Good for her! And good for you because you can go here and support her. Good: Winning the photo caption contest at Mason Dixon Knitting. I’ll be getting a signed copy of the book AND a dishrag kit. Doesn’t get any gooder than that, really. Hope the alergies and headache abate soon. Can you get a special dispensation for the insurance? Argh…I am with you on the prescription stuff. They got Gracie on her Singulair. It’s gotten insane. Congrats on the winning! Your Panera story made me laugh out loud – it seems very Seinfeld 😉 Great new yarn from Dave! and congrats on winning the contest at Mason-Dixon! We can both do dishcloths! Carole! Thanks so much for the mention! Love that handdyed sock yarn. You forgot one good:you get to spend a wonderful day seeing “Wicked” with your favorite daughter. Oooh! Panera soups are so yummy. What kind is it that you want but they’re not serving? I love that ther eis a soup schedule. I got a chuckle out of that. Uh oh, looks like I’m going to get hunted down by Rachel and Margene. Congrats on the M-D contest! Mmmmmm…soup. Well, I can easily see why it might be an issue for some. I’d be irritated if the soup schedule lied to me, too. So which one is your favorite? I really like the sock yarn. Is that the coveted Cabin Cove blend? hey congratulations on winning the contest. i just want to mention however that although i haven’t been knitting dishrags, i’ve been a big fan of peaches n cream and sugar n cream cottons. it’s funny how all it takes is for blog rockstars to start knitting with them and then it’s all about the basic cheap cotton yarn. bah! I love the Good, Bad & Ugly posts… Congrats on your caption win! Definitely more goods than bads. But oh-such-a-bummer about the allergies and the meds. I really feel your pain on that. Amen on the prescription stuff. I have two of my three kids on Zyrtec and it isn’t covered. 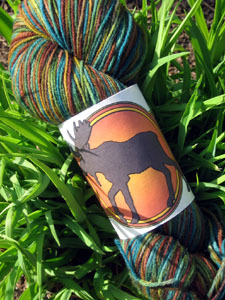 Moose yarn is added to my list. I like labels with animals on them (the socks yarn inside the label is nice too). I certainly can relate to your Zyrtec problem; been there, and even had an insurance company that USED to cover it deny coverage last year. Have to remind my workmates to save me some Zyrtec samples. Claritin just doesn’t do it as well. Hang in there. Oooh, I love Panera too! I was *really* disappointed when they changed their black bean soup recipe. The newest one I want to try is the Spring Pea soup.